Tools & Notions > NEW!!! Wool Mats - Custom cut available!!! Natural wool felt is one of the oldest man made textiles. Many cultures have legends as to how the felting process was discovered. One of the earliest accounts of felting details how nomads fleeing persecution, packed their sandals with wool to prevent blisters while crossing the desert. At the end of their journey, the movement and sweat had turned the wool into felt socks. Today’s pressed wool felt is made via an intricate process often referred to as “wet processing”. Fibers are worked together by pressure, moisture, and vibration, then carded and cross-lapped to make multiple layers of material. The ultimate thickness and density of the material determines the amount of layers that are then steamed, wetted, pressed and hardened. The majority of fiber used in pressed felt is wool. Wool fibers have small barbs on them, which aids in the natural locking or felting process. The manufacturing of pressed wool felt is primarily mandated by SAE standards (See the SAE Felt Specification Chart under Quality/Resources above). These standards determine the wool content, density, and other physical and mechanical properties of the felt. 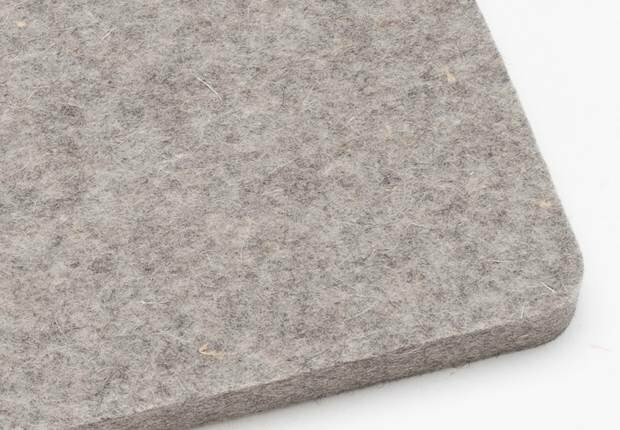 Pressed wool felt is identified by the SAE standards F-1 through F-26. Wool Mat 12" x 18"
Wool Mat 8.5" x 14"
Wool Mat 18" x 24"
Wool Mat 18" x 18"
Wool Mat 9" x 9"
Wool Mat 4" x 4"